What mom couldn’t use an easy lunch idea for kids with a new school year right around the corner? 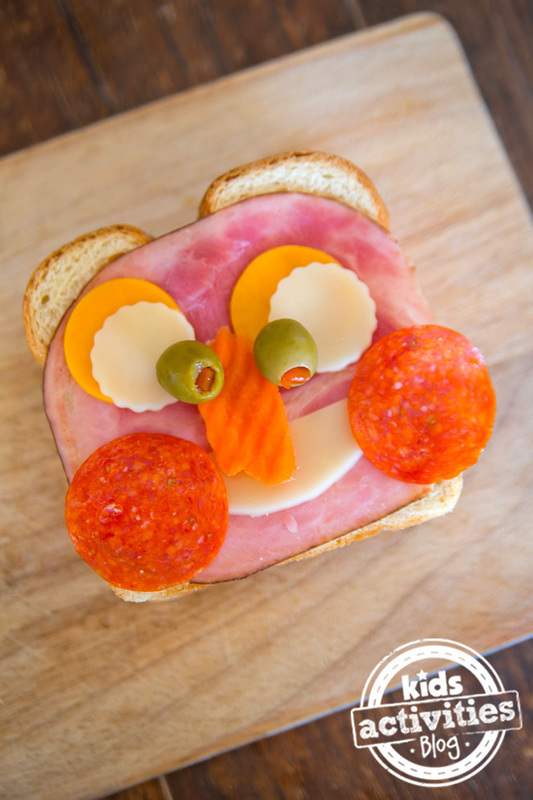 Turn a plain ol’ ham sandwich into a fun activity and let little ones create Sandwich Faces! This simple idea can even work if you’re looking for snacks for picky eaters. Choosing food that your child enjoys will make it that much more fun to use their imagination! 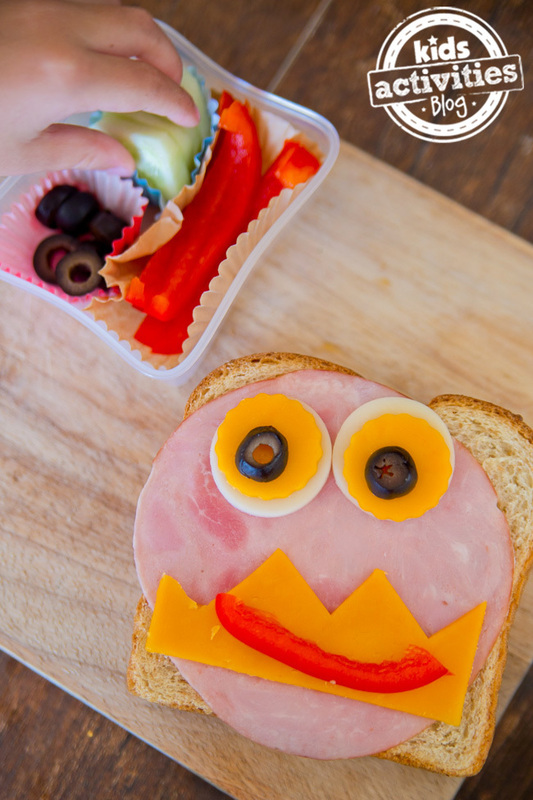 We partnered with Nature’s Own, a Kid’s Activities Blog sponsor, to bring you these cute sandwiches your kids will love! When packing a school lunch, we make sure to use quality products that taste great. There’s nothing worse than opening a lunchbox to a soggy sandwich! That’s why we choose to serve Nature’s Own breads to our family. 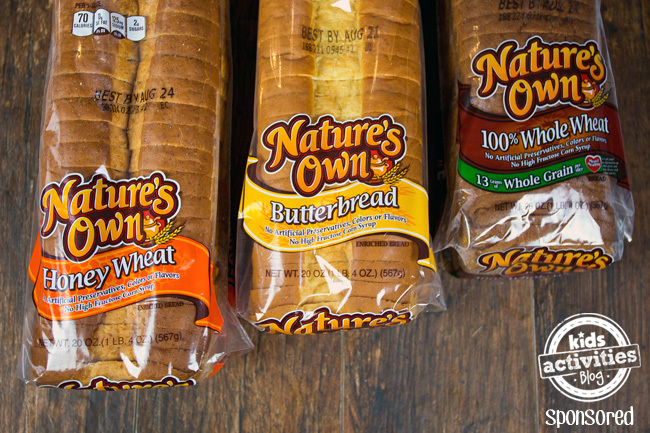 We tried three different varieties: Nature’s Own Butterbread, Nature’s Own Honey Wheat Bread, and Nature’s Own 100% Whole Wheat Bread. I trust the quality of Nature’s Own breads because they contain no artificial preservatives, colors, or flavors, and no fructose corn syrup. My family loves the Honey Wheat Bread, but any variety will do for this easy lunch idea. Other snacks like pepperoni, pretzel sticks, etc! Cut cheese into circles and other shapes to create the base for the eyes and mouth of your face. Place meat and cheese between two slices of bread and package if you are sending as a school lunch. In a smaller container, separate vegetables and snacks using the cupcake liners and add to your child’s lunchbox. Now they have everything they need to make a fun sandwich face! Assembling the silly faces is really easy — my son had so much fun using all of our different pieces to make our creations! 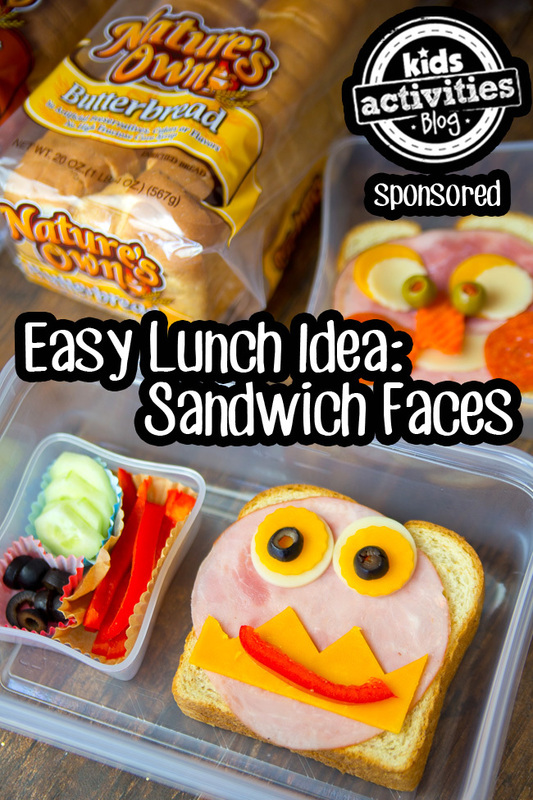 For more fun lunch ideas be sure to connect with Nature’s Own on Facebook, Pinterest, Twitter, and Instagram! Previous Post: « Pentatonix ‘God Rest Ye Merry Gentlemen’ Is A Perfect After-Thanksgiving Treat!